Rising senior Jeannie Ake demonstrates a listening intervention at the Well·Spring Solutions Day Advantage adult day center. Music entertains us and enriches our lives. It also brings back memories and can transport us to a different time and place. Through a variety of mechanisms – both evident and unseen – it can play a strong role in our well-being, at any age. A study called “Music and Well-Being,” directed by Dr. Cassandra Germain, recent faculty teaching statistician in the UNC Greensboro School of Nursing and a faculty affiliate of the Gerontology Research, Outreach, Workforce, & Teaching Hub (GROWTH) network, seeks to examine the effects of music in the quality of life of adults with dementia or cognitive impairment. 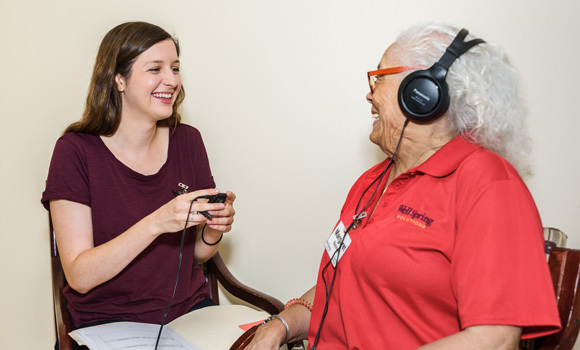 The project goal is to help reduce the symptoms of depression and anxiety through individualized “music interventions,” or 15 to 20-minute listening sessions, which take place at Well·Spring Solutions’ Day Advantage adult day center. Rising senior Jeannie Ake, one of the Music and Well-Being team members and a UNCG Honors College student, has a passion for working with older adults. A philosophy major with a minor in gerontology, and a special interest in music therapy, Ake learned about the study last year from her professor in the Gerontology Program, Dr. Rebecca Adams. Ake’s grandmother, who was born in 1924, passed away several years ago and had dementia. Ake says her love for her grandmother inspired her to pursue something that could help people in that position. With Germain, Ake helped organize an iPod Shuffle drive on UNCG’s campus, and also helped in providing the caregivers with information, and in conducting pre-assessments with the Well·Spring participants. They designed individualized playlists for some participants beforehand, and for others they developed the playlists throughout the study. Over the span of four weeks, they facilitated listening sessions twice weekly with participants. They also spoke with participants and caregivers to assess how symptoms of depression or anxiety had changed or lessened. In June, Germain and Ake were joined in their work by other UNCG Honors College students Crystal Allen, Miracle Johnson and Myranda Cook. The work was not without challenges, but even those challenges brought rewards. Also assisting in the study was Joanna Hartness ’17, who joined Well·Spring Solutions as activity assistant after earning her bachelor’s degree in community and therapeutic recreation with a minor in gerontology from UNCG. Hartness will soon earn her license to practice recreational therapy, so that the listening sessions will continue at Well·Spring Solutions even after the study has concluded. She looks forward to learning more about favorite musical selections to add to the growing list that includes The Andrews Sisters, Bing Crosby, Nat King Cole, Frank Sinatra, Little Richard, Louis Armstrong and Mahalia Jackson, as well as classical choices like Beethoven and Tchaikovsky. Germain would like to use the results of the study to expand opportunities for caregiver education. As for Ake, she’s planning for graduate study and a career that will allow her to continue making a difference in the lives of senior citizens. For more information about gerontology at UNCG, including the minor, post-baccalaureate certification and master’s degree program, visit the website here.